The fact that God Himself calls the prophet Hosea’s visionary wife His own wife, reveals that she represents the church, that Hosea represents God, and that while Jezreel represents the mouthpiece of God, Ammi and Ruhamah represent the church membership. 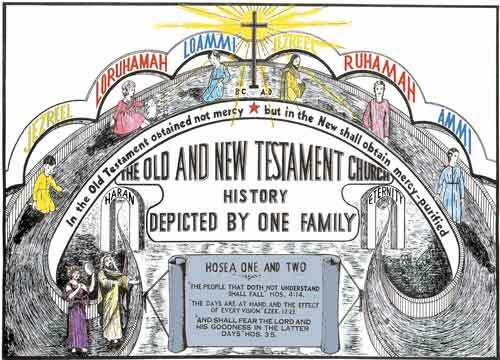 In childhood (Hosea 1), they represent the Old Testament church, the Hebrews, but in their youth, having their names altered, (Hosea 2), they represent the New Testament church, the Christians. Now that the laity, at the command of God are through a prophet to plead with the church, therefore, the reformation here called forth is sponsored by Inspiration and carried out by the laity. It is the long expected revival and reformation to the Laodiceans, and hence a layman’smovement called forth by the revived Spirit of Prophecy. From this prophecy, you see, the Denomination is by God Himself charged with “whoredom,” with having illicit connections with the world. This lewdness she must give up if she is to obtain favor with God. The Denomination often boasts of gain in membership (children), but God charges that those whom she brings in are illegitimate children! And how could it be otherwise if the church herself is corrupted with the world? What else could her converts be? What would free them from the worldly influences, if she (the ministry), is herself tainted with the practices of the world? Indeed her converts cannot be lawful children. Here we see that the church proposes, but that God disposes; her plans do not work out as expected — she loses her way as does a ship without chart or compass drifting at sea. This is exactly what happened when the “Dark Ages” of religion began. The Pagans in whose clutches the church fell were no more to blame for the church’s going into darkness than were the Chaldeans of destroying Judah and her temple. The real blame falls on the church herself. And this should be a lasting lesson to each of us, that we should never again have illicit connection with the world, should never depart from the Lord. Notice that the Lord visits the church not when she is in good spiritual standing with Him, but when she is in her greatest idolatry. Indeed, He could not visit her at a more opportune time, because only when she is in greatest darkness can she possibly discern light. And her condition, you know, can never improve unless He should call on her. Thus it was in John the Baptist’s day, also when the Protestant reformation came, and thus it is today. God knows how to save. Saving is His chief concern. “God requires certain things of His people; if they say, I will not give up my heart to do this thing, the Lord lets them go on in their supposed wise judgment without heavenly wisdom, until this scripture [Isa. 28:13] is fulfilled. You are not to say, I will follow the Lord’s guidance up to a certain point that is in harmony with my judgment, and then hold fast to your own ideas, refusing to be molded after the Lord’s similitude. Let the question be asked, Is this the will of the Lord? if not, Is this the opinion or judgment of __________?” — Testimonies to Ministers, pg. 419. And what is God’s promise now to His church? As a result of her vineyards’ being restored, and also of her being given the valley of Achor for a door of hope, the church is to sing as in the days of her youth, as when she came up out of Egypt and lodged in the Promised Land. What could her vineyard be but her own land? And if the valley of Achor is for a door of hope to her, what can it be but what it was in Joshua’s time — removal of the Achans of today from her midst (Hos. 2:15)? Indeed, this is her only hope — in fact, even more so than it was in the day of Israel’s defeat at Ai, the gate to the Promised Land. “Here we see that the church — the Lord’s sanctuary — was the first to feel the stroke of the wrath of God. The ancient men, those to whom God had given great light, and who had stood as guardians of the spiritual interests of the people, had betrayed their trust. They had taken the position that we need not look for miracles and the marked manifestation of God’s power as in former days. Times have changed. These words strengthen their unbelief, and they say, The Lord will not do good, neither will He do evil. He is too merciful to visit His people in judgment. Thus peace and safety is the cry from men who will never again lift up their voice like a trumpet to show God’s people their transgressions and the house of Jacob their sins. These dumb dogs, that would not bark, are the ones who feel the just vengeance of an offended God. Men, maidens, and little children, all perish together.” — Testimonies, Vol. 5, pg. 211. Here is peace, the only peace that one can have today if he so desires. This is peace overflowing with safety. The saints, after the sinners have been removed from among them, need not fear beasts, fowls or creeping things of the ground, neither gun nor sword; they shall lie down in confidence and assurance that nothing shall hurt them, for He “Whose fan is in His hand,…will throughly purge His floor, and gather His wheat into the garner; but He will burn up the chaff with unquenchable fire.” Matt. 3:12. To hear the corn, the wine, and the oil is to hear them speak, and since real corn, wine, and oil cannot speak, they must be figurative of spiritual food and drink — figurative of the mighty message in the great and dreadful day of the Lord. And by the fact that the people of the earth shall hear Jezreel, the mouthpiece of God, it is made clear that the call, “Come out of her, My people, that ye be not partakers of her sins, and that ye receive not of her plagues” (Rev. 18:4), will accomplish its appointed work. Those who come out, go into the aforementioned place of safety. And those who do not hear Jezreel shall perish as did the Jews who rejected the prophets in their day. Here we see Jezreel, Lo-ruhamah, and Lo-ammi as little children pictorially representing the kingdoms of Israel and Judah in their calamities, a complete but brief history of the Old Testament church and her people. Then we see that the letters “Lo” are dropped from the names Ruhamah and Ammi, denoting a change of names — Jews called Christians, — meaning “mercy” and “My people” instead of “no mercy” and “not My people.” Jezreel’s name, though, remains the same, and as he represents the prophets of God in all times, this shows that they are the descendants of Jacob and therefore we must hear and obey them. The family as little children representing the people of the Old Testament church, and as youth representing the New Testament church, show that spiritual growth has been made through the stream of time, that they are now grown, able to take “strong meat,” and truly to be the reformers to the church, and the missionaries to the world. We also see that the same mother and the same father, along with the same children, represent both the Old and New Testament churches; that the descendants of Jacob in reality are the old olive tree (Rom. 11:24), that the only way the Gentiles can get into the kingdom is for them to be grafted into the old olive tree. Jew or Gentile, all must join it if they are to be in the kingdom. This can be done only by our own consent and action now while the Spirit is pleading with us, and while the Lord stands ready to do the work. No one need be excluded. No one need remain a lukewarm Laodicean unless he so chooses. My hope is that all will choose life rather than death. Clearly, then, lewdness shall actually flee away, and this revival and reformation brought forth by this layman’s movement shall accomplish its given work. And so, you see that as a result of the childrens’ protest, the whole family of God shall live happily in peace and safety forevermore. What a beautiful story described in Hosea. The all -loving God gives His all and goes all out to win back “Mother”. Yet she will not return and He must execute , as a last resort, judgment “the valley of Achor for a door of hope” upon His people. Very soon the relationship with the King of Kings shall be one of “Husband and wife”, do we realize the utter privilege that awaits those who are prepared for the Lord’s visitation upon His remnant people, those who have accepted His final message of Elijah? This entry was posted on July 2, 2016 at 4:37 am and is filed under Elijah Interpretations, Prophecy study. You can follow any responses to this entry through the RSS 2.0 feed. You can leave a response, or trackback from your own site.